At the beginning of 2010 I set a goal to complete my first triathlon and to run two half-marathons. (I like to do my marathons one half at a time.) And while I was setting goals, I decided to go for breaking my personal record of running 13.1 miles in 2:05:02. This year I will break the 2-hour mark. Do I really think life is going to simply unfold just the way I plan it? You would think by now that I would know better than that. My 11-year-old nephew Alex (yep, that’s the Alex you all know and love) joined a Run Club. He began running three days a week after school with trainer Kasey Payzant and her club, which includes about twenty-five kids, ages six to eighteen. Then… my 13-year-old daughter Leah joined. 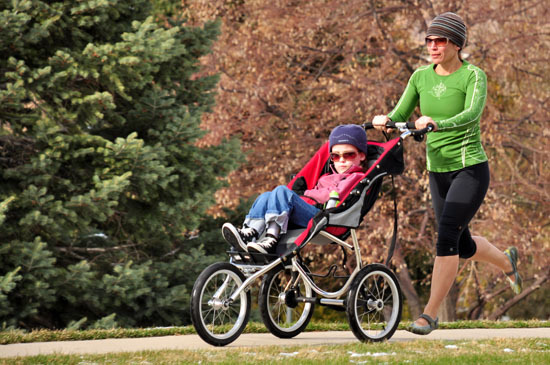 Most of the parents drop their kids off to run for an hour, and pick their kids up later. That’s fine for most parents, especially since the Run Club is geared toward kids, but my husband Aaron and I like to do things a little different so we asked if “big kids” like us, could join too. By the time we joined, many of the kids in Run Club had already committed to running the Salt Lake City Half-Marathon in April. Aaron and I were already registered. Last year, Aaron and I ran two half-marathons and we crossed the finish line before our two daughters, sleeping soundly at home, had even woken up. Come to think of it, we go to the gym when our kids are at school. Aaron and I often hit the ski slopes right after the bus picks up Lucy for school in the morning. My kids haven’t seen and may not even know about most of the physical activity and training that goes on in their parents’ lives! Ever start writing a blog and just end up boring yourself? I’ve had 2 sitting on my desktop with no compelling reason to complete them. They’re just not good. So, instead I am going to invite you to check out Oregon with me! I flew in to Portland on Thursday night. Lindsey (remember her?) was flying in a few hours later, since she had a college class that she just couldn’t miss. I never fly in on the last flight of the day, because if it is cancelled, or I miss it, well, there is no Signing Time event the next day. So, I took and earlier flight and Linds took the last flight. It’s been awhile since I traveled with Lindsey. Luckily, Lindsey was able to come along, since it is just too early to leave Lucy with a sitter. Lucy was only 2 weeks post-op. Lucy’s surgeries went really well! She had three procedures and it took 6 hours. She is very resilient. For this Oregon trip, Aaron stayed home with Leah and Lucy. While waiting for Lindsey’s flight to arrive, I knew I would have about 4 hours to kill… so I picked up a ticket to see The Killers, who were playing that very night. (Yay for me!) No, I am not afraid of going to concerts or movies by myself. The show was amazing. It is my goal to get Baby Signing Time to the lead singer, Brandon Flowers, he has a newborn and a toddler and I would love for them to sign with me… since my family sings along with him. After the show, I picked up Lindsey and we dove 80 miles to Cannon Beach. We checked in and hit the sack. The bummer with driving in the middle of the night is you miss the beauty. In the morning we met up with Debbie, whose organization brought us out there, and we had brunch at a place called Wanda’s. This was the first of many AMAZING meals we would have on this trip. I had oatmeal… oatmeal… and it knocked my socks off. I mean really, how often can you say you’ve had an amazing bowl of oatmeal? … Me neither! Though, you are more likely thinking, “You ordered oatmeal? Who orders oatmeal?” I do. Okay? I order oatmeal. Next we visited Nehalem Elementary School. I shared a sign language story time with the Life Skills Class. Then did a Signing Time Assembly for the entire school. It was still fairly early in the day, so Linds and I drove back to our inn and threw on our swimsuits (silly California girl!) and hopped back into our PT Cruiser and started driving the coast. We pulled over to get our toes in the sand. We always ask the locals for dinner recommendations and this time we were pointed toward “The best seafood!” a restaurant called Pirate’s Cove. We drove back to the inn, stopping to pick wild blackberries and raspberries that seemed to run rampant everywhere we looked. The following morning was the Buddy Walk at the Beach, in Seaside. The weather was perfect. The walk was just the right length. I got to meet Lucy’s personal Fan Club, little Dru. Then it was time to walk. We all gathered for a photo on the stairs that lead to the beach. It felt like a “Where’s Waldo” scene, since most everyone had their Buddy Walk shirts on and I was wearing my signature orange. Lucy’s buddy, Josiah and his family were there. You may have seen Josiah in “The Great Outdoors” exploring on his crutches or smiling next to Lucy. Josiah and Lucy go WAY back. Josiah’s mom, Gina, was the 77th fetal surgery for spina bifida patient and Lucy and I were the 82nd patients. While on bed rest we got to know each other and kept tabs on the progress of these special kids. We all made our way to the Convention Center where my Signing Time performance would be. Before singing Caterpillar Dreams, I introduced Josiah to everyone. It was sweet to see him on the screen behind me and to see how much he has grown since we filmed those scenes. When most everyone had left, I noticed some bumper boats for rent nearby. Lindsey and I put everything in the car and then ran down to rent bumper boats. There was an option to rent water guns as well. At first we loved the idea, but on second thought… that water looked uncomfortably brown. We packed up and decided to drive some more. The landscape was eerily familiar and we realized that this must be where they filmed the movie Goonies. A google search later that evening confirmed that hunch. For what it’s worth Kindergarten Cop was also filmed in that area. After that we went to the Tillamook Cheese Factory for grilled cheese sandwiches and ice cream cones. We toured the factory and of course tried out the samples. My favorite? Horseradish Cheddar. Don't Forget the Extra Cheese! When the factory closed, we drove to Portland, since we were flying out in the morning. I love Oregon! I know, I have said it before, but I do. That place just speaks to my soul. The greens are so green! The landscape transitions so abrupt. Who puts a beach right next to a forest? I have loved traveling for the Signing Time events in Salem and Klamath last year and when I was 19, my girl friend, Jessica and I had hopped in my VW Bus and drove to Eugene on a whim. I am trying to figure out the best way to get more of Oregon? Should we take a week or two and drive the coast this summer? Camp? Camper? Bed & Breakfast? Should we move to the coast for a month? What is the best way to get more Oregon? Should I sign up for the STP 2010 (Seattle to Portland Bike Race). I don’t know how, and I don’t know when, and even worse I don’t know why! Something is pulling me toward Oregon. I really thought that running out of gas in your car was a universal experience. I mean, isn’t that why we have AAA? Paying for AAA is essentially paying for the luxury of running out of gas! It’s why I have AAA. A few months ago I realized that, I am still pretty young and there is still a lot out there that I could learn. I challenged myself to learn something new every month. I thought about learning to scuba dive and realized that if I really, REALLY hated it, then I didn’t ever have to do it. How could I know if I hated it if I didn’t even give it a chance? That is how I ended up in a PADI scuba class in November. I only have one fear in the ocean… SHARKS. I have logged WAY too many hours of “Shark Week” on Discovery. But, I also have watched enough Shark Week to feel pretty confident that should a shark come near me, I can keep my senses and bop it on the nose really hard – (which BTW sends them swimming off) AND I have also watched enough “Shark Week” to imagine myself an apprentice Shark Whisperer, able to hypnotize that same shark by carefully stroking it’s nose and then turning it over, leaving it calm and sleep-like belly up. Hopefully I will never have the opportunity to try either one. In our first scuba class, someone else shared that their main fear while scuba diving is running out of air. The instructor, Dave who is a long time friend of my husband, answered saying, “A lot of people have that fear. But you have an oxygen gauge like you have a fuel gauge in your car. I mean, how many of you have ever run out of gas?” I, all too quickly and proudly, raised my hand high in the air before I realized, that mine was the ONLY hand in the air. “Oh puh-lease!” I said, “None of you have EVER run out of gas?” My classmates averted their eyes and maybe relished this awkward moment. I considered calling them all “LIARS!” Instead, I addressed our instructor, “Dave? You can NOT tell me that you have NEVER ever run your car out of gas!” Dave responded that he had not… never… ever. I was shocked. Dave looked at the rest of the class and said, “I guess we’d better keep an eye on this one!” and shot a glance at me. Maybe it is a bad thing that my fear is of sharks, rather than running out of air. I don’t know. So, long story short, I am now PADI certified. Here’s the proof! I’m keeping that puppy right next to my Bradley Birth Coach card… though I think the PADI card has a better chance of seeing the light of day. The PADI certification was pretty standard. The first few evenings were spent learning our gear and testing it out in a swimming pool. The last few evenings were our open water dives. I live in Utah. Our open water diving locations are… interesting. There is a murky lake- (Gah! Maybe I also have a fear of being underwater and NOT being able to see 2 feet in front of me… yes, I think I DO have that fear, because my heart is POUNDING just imagining it!) And then there is The Crater. The Crater is warmer and clearer than a murky lake. It is a natural hot spring, 96 degrees, 60 feet wide and 65 feet deep. So, we finished certifying in The Crater and voila the next day Aaron and I were off to Cancun for a few days. (That worked out perfectly) and I would be able to put my new diving skills to the test. We set up a couple of dives immediately. Our first day diving would be a two-tank dive in Cozumel through a company called Aqua World. Here is where it gets sticky. You may have heard stuff about diving, like how you should plan the dives so you are not flying the next day or how you can’t dive while you have a head cold or how your deepest dive should be first or maybe you have heard about safety stops if you go to certain depths, so that you give your body a chance to get rid of the excess nitrogen. Which reminds me… once when I was 12 my dad took us deep-sea fishing and I caught some wacky fish that was apparently a bottom dweller, because when I brought that sucker up to the surface, it completely exploded! Keep THAT in mind as I continue! Another cool gauge tells you how deep you went. It clocks the deepest, depth. THAT is important because when you complete your dive you calculate how long your next dive can be, how much time you need to stay at altitude between dives especially if you are diving again soon. Because no one wants to get the bends and spend their vacation channeling Michael Jackson in a oxygen chamber. PLUS since I just BARELY certified as an open water diver, I should only dive to a depth of 60 feet, in fact the fancy little chart only goes to 90 feet for a 21 minute dive before it is marked in gray. Stay out of the grey! If you go deeper than that, the numbers are in black… black is bad. No one wants to know what happens after you pass the black box. But what do we have to fear? We are in Mexico! With a dive company! They are certified and licensed in Mexico we can TOTALLY trust them. Can’t we? The first dive is finished and we get back on the boat. The dive was AWESOME, especially the part where there were tunnels and Aaron told me to swim down so he could get a photo of me in front of the opening. (Though our camera did not work at that depth and took on water so none of the photos turned out) I swam down. Low and behold, IN the opening, no, GUARDING the opening was a massive silver fish, sporting a serious overbite with a row of sharp, white, gleaming teeth! I didn’t know what it was, but it was huge and scary! I screamed underwater… no one heard but the dolphins, and I swam out of there before Aaron knew what happened. As a side note, sign language is the best! Everyone, EVERYONE was so jealous that Aaron and I could have FULL conversations while they were limited to “OK?” “Share Air” “Go UP” “Go DOWN” – the Dive Masters were even jealous. Aaron took a look and he came back smiling. Not that it wasn’t scary and not that we weren’t out of our element and that we really were completely on snaggle-tooth’s turf, but I think he just liked seeing me swim so fast. Oh, here is a great scuba prank. I believe in payback. At one point I got parallel to Aaron, not side to side, but I was swimming about 3 feet above him. He had lost me in his peripheral vision, which happens even when you ARE a scuba buddy and I used it to my advantage… if getting out of your buddy’s sight can be called an advantage… I swam up a bit. Then I reached down and with a claw hand-shape, I sunk my nails into his… rump. He took OFF! I couldn’t hear him scream, but I am pretty sure the dolphins did. As the first dive came to an end, we came up to 15 feet below the surface to do a safety stop. That means you hang out at 15 feet for 3 minutes, as long as you didn’t go deeper than 60 feet. If you went deeper, you need to hang out longer at that depth… for 15 minutes, I think, but like I said, I am not certified to dive that deep. Ah, now we return to the boat and get ready for another dive. I take a look at my depth gauge so I can figure out my pressure group since we were planning this second dive AND then a wreck dive the following day. (Diving to a wrecked boat) Let’s see on this first dive, we dove for 35 minutes (I wrote that on my Diver’s Log and… and… uh-oh… guess what my depth gauge said? I went 90 feet. 90 feet? 35 minutes and 90 feet? That doesn’t even show up on my little dive planner graph! I have NO idea what pressure group I am in! This is BEYOND the bad numbers in little black boxes. I have NO idea how to add that to my next dive! I have no idea how the nitrogen is going to carry over through the next day! I wrote down “90” for the depth and “35 minutes” for the bottom time. The rest of it is still blank. Dear PADI instructor Dave, I changed my mind, my biggest fear is neither sharks nor running out of air. My biggest fear is having my insides come out of my eyes, like that poor little sole I caught when I was 12! The next day I woke up with a serious head cold. There is a hard and fast rule in diving, that you DO NOT dive if you have a cold. But… I had heard that you can take Sudafed and still dive, but you are risking your sinuses imploding if the Sudafed wears off while you are mid-dive. Who even knew that there was so much possible exploding and imploding out there? Then, the weather turned bad and the wreck dive was cancelled. The wind kept up and so did my head cold and the wreck dive was cancelled the following day too. Like I said, all is well that ends well. Right? The real bummer is I didn’t even see one shark! I saw baby turtles and all kinds of tropical fish. Years of NOT scuba diving because of sharks gone to waste! All that “Shark Week” training, and no sharks? Oh well, maybe next time. Besides, how do I even know if I am REALLY afraid of sharks, without seeing one face to face? Merry Christmas! Happy Hanukkah! Happy Kwanzaa! Happy Holidays! Happy New Year! We hope you are celebrating and making memories with your friends and family. This year, at our Signing Time Christmas Party, we filmed a couple of songs for you. I hope you enjoy them! The night before Thanksgiving, I was thinking about the things I am thankful for and then I thought that I could probably surprise myself by actually diving into my journals and reading how it really was. I have 10 journals, so I opened one up to see what year and what thoughts it held… The first one I opened was from 6 years ago. The entry written about the Christmas after we shot Signing Time 2 and 3. Christmas was hard. We had nothing and could give little, even to our own kids. Aaron and I didn’t give each other gifts. Two days before Christmas my dad gave us $200. The next day my sister Julie gave us $200. We were then able to get Leah a bike and a Gameboy. She also got all of her Signing Time wardrobe clothes and the “Leah Doll” – it was pretty humbling. After I read that I called Aaron in. I read it to him and we both sat there stunned. We had to think, really hard to even remember that Christmas. The following morning, Thanksgiving Day, I pulled my dad and my sister Julie aside and thanked them for giving us Christmas 6 years ago. Neither one of them vividly remembered helping us out. Just as I didn’t vividly remember the Christmas we really needed help. If it hadn’t been in my journal, would their generosity and our need have been entirely forgotten? Then I couldn’t stop. Each night I have poured over my journals. It’s been painful. It’s been funny. It’s been an interesting journey, to say the least. My journals are stuffed with concert tickets, notes, postcards, scribbles from Leah, photos, and songs I have written. Little Leah Jane whose daddy would run his fingers over my belly and say “Here’s your spider, here comes your spider!” Leah whose heels and knees I could slide around, whose little leg would press out hard as I massaged it. Leah with hiccups- Leah at 1:00AM and 10:30AM playtime. Leah, who I threw up every day for. Leah who I prayed about and worried about. Leah, who made me what I’ve wanted to be most for years – a mom. My little girl’s mommy. Leah with me while I hiked in Boulder, Utah. Leah in Bryce Canyon. Leah hiking the Zion’s Narrows. She’s my little girl. My sweet little girl now and for always. I love my daughter more than she may ever know. It’s 3:20AM and I’m crying my eyes out. You’re here asleep next to me and your dad’s on the other side of you and that’s where we will always be, right beside you. I don’t know if I’ve ever felt so alone in my whole life. I feel like there is no one I can talk to because no one would understand why I’m crying. Actually I think they would misunderstand. I don’t want anyone to feel sorry for me or for Janey. I don’t want to call our families and tell them what “PK” the audiologist told us today. Half of my tears are simply tears of relief. The wondering and questions are done. A tearful release of 2 1/2 months- fears, hopes, anticipation and prayers. I know it’s not helpful but I can only blame myself, and it’s eating me up inside. I think that in his heart Aaron blames me too. In only these past few months people have asked if Jane’s hearing loss is because of my band. And playing and practicing while I was pregnant. People ask. Or they say “boy that must be devastating with you being a musician and music meaning so much.” Do they really think I give a S#*! about my music in comparison to my DAUGHTER? I’d never sing or play another note if it mattered. Music is nothing to me. Leah Jane is my world. She is wonderful. She is beautiful. I feel like the biggest obstacle in her way is me. I don’t know sign language. I came so close to learning it, so many times. But I didn’t. I feel bewildered. But I feel thankful that we caught it as early as we did…. …I know of 3 people who are deaf. I’ve had conversations with only one of them ever. I hardly know what the term means. I remember the deaf kids in Jr. High and High school. I sure could not tell you any of their names. They all stayed together with their interpreter and I never gave them a second thought. Severe – Moderate – Mild mean so little all your life. But today, I was told my daughter has a severe hearing loss. And I still barely grasp the concept. But the word SEVERE is clanging around in my brain. SEVERE? What does that mean? And what does deaf mean? Is there a scale to measure it on? If hearing aids help you are you still deaf? She has the most beautiful lips and puckers for kisses. She also puckers when I tell her “NO” because it looks like kisses. How can I keep a straight face when she does that? When she gets frustrated she hits her head with her hands, or on the floor. When she’s nursing, she looks up at me then squeezes both eyes shut tight and then pops them open. She nurses, and the corners of her mouth turn up in a smile. Maybe she’s never heard me say the WORDS I love you. But you know what? It doesn’t matter. It doesn’t matter at all. She probably knows it more than most kids who hear it every day. How perfect! The day after I posted about Marcus, I got a call saying that I had not only been nominated, but won Wasatch Woman Magazine‘s – Wasatch Woman of the Year Award for 2009! How cool is that? I was nominated (by a fabulous Signing Time fan, Tammy T., who will receive all sorts of cool Signing Time swag!) under the business category, but I won the overall award!!! That also meant I had a photo shoot coming up and would be on the cover of the magazine. I figured what a perfect chance to take you all along! Now remember, Thursday I found out there would be a shoot on Tuesday. I quickly made the necessary calls. Then I made an appointment to get my nails filled, because they were about as bad as my roots. *Little Secret* I am not a girly girl. I only get my hair and nails done when I have a shoot or an appearance or a performance. It makes me crazy to spend an hour in a nail salon or three hours in a hair salon. I NEVER wore make-up or used a hair dryer in my real life prior to Signing Time. I learned everything I know about hair and make-up from our crew. In high school, Emilie did my hair and make-up for important occasions, like dances. Now, when I get ready in the morning, if I have a meeting or something, Aaron says, “Let me get this straight… are you going to do your hair and make-up EVERY morning for the rest of our lives?” The other day I went to work with a baseball cap on a ponytail. I think he was relieved. When I have a shoot and come home with all that make-up on, he asks, politely, if I plan on washing it off or just hanging out that way for the rest of the day. He thinks make-up is pretty gross and I think he misses his “granola” wife! Michael called me back and scheduled me for Saturday. Marcus called me back and said we could shop after my hair appointment. Saturday was also the University of Utah vs BYU football game and Aaron had tickets. This meant Leah and Lucy would be with me for three fun filled hours of salon and then a long shopping trip. Saturday I loaded up the girls and got to the salon. They took my iPhone and stayed pretty busy, taking pictures of me and of each other. Then the esthetician took pity on them and offered to paint their nails for free. We loaded back in the car and called Marcus. We met Marcus for dinner and then dove into Anthropologie. Leah and Lucy ran/rolled around, trying on hats and giving me the “thumbs up” and “thumbs down” as I tried on countless outfits. Finally we had narrowed it down to 2 outfits and I told Marcus I would bring some other options from home on the day of the shoot. Fast forward to Tuesday morning. I got up at 7, loaded my car with clothes, shoes and jewelry and got to my hair and make-up appointment at 8 at Tranquility. I arrived at Cafe Niche for the shoot at 9:30. Marcus had been there for 15 minutes. The rolling rack was set up and everything was steamed. Lindsey was already there too. The art director took a look at my clothing options and we decided to go with 3 different looks, since the plan was to have me on the cover and photos inside with my story. Look #1 was some stuff I just brought from home, the art director said my collar had a personality all its own, so Marcus took that as a cue to use his toupee tape and mold that collar, forcing it to follow his artistic whims. Look #2… I can’t even remember, I guess we will see when the magazine comes out. Maybe the red/orange top and jeans. They were shooting all the winners for each category. I wasn’t in a hurry, so I called Aaron and asked him to meet me there. That way we could have lunch after the shoot. Look #3 was a dress we found at Anthro. They wanted to shoot it on a white wall, but the only white wall had someone sitting at a table eating in front of it. We finally shot it outside against a white shed. We wrapped around 3pm. Aaron and I ate lunch. Marcus loaded out… still sporting toupee tape on his hand 🙂 and that fanny pack is filled with all the secrets I shared before. So- he is allowed to wear a fanny pack. Oh, sort of the end. I will be featured in the January/February issue. I am even supposed to be on the cover!